To be fair to Kusuha, in the alpha games its Bullet who gets kidnapped/brainwashed. OG just reverse it. I also hate to burst peoples hopes but the first route split of moon dwellers isn't really a choice between Touya and Calvina. Its more a choice between starting the game with newer characters or older returning characters. The Earth route introduces Soul Saber and Compatible Kaiser, along with Touya and the new aggressors (Kia, Lamia, Seolla, Adrado (I think ). While the moon route does start with Calvina it also has the SRX team (and you can immediately form SRX) and the new PTX team (Irm, Ing, Rio, Ryoto). Oh and Touya is most certainly the main character of the game (as much as any OG has every had a main character) though Calvina gets her development. I just don't want anyone expecting that by picking the moon route at the start they will make Calvina the main character of the game. That is not the case. it's seems coustwell is in the game!!!! i wonder if its a secret? Yes, the Coustwell is a secret in the game but its unclear what the requirements for it are. Good news is that both Touya and Calvina can pilot Coustwell. Have a video of Lat out Ryusei-ing Ryusei. Ongoing list of Ace Bonuses/FUBs/and known secrets. The better news is that due to the Granteed Draconis' plot mandate locking Touya to it by the late/endgame, Calvina basically gets the Coustwell all to herself. The bad news is that the Coustwell will not be getting its finisher this game, thus making it the strictly inferior ride to Granteed (though still superior to Bellzute). It'll most likely unlock for Touya once he's forced to fork over the Granteed in OGs3. Actually, the Bellzelute gets its finisher too so its still better than the Coustwell. Bellzelute is basically on pair with Exexbein so theres no need to have Calvina pilot anything else if you don't want too. I'm not sure if other pilots can use Coustwell, if so it could be a good choice for pilots that don't get their own unique advanced mech like Gilliam. Also, Moon Dwellers IS OGs3. This isn't a gaiden game. They just dropped the number to avoid confusion with new players. Remember OG 2 and 2nd OG are different games. Technically 2nd OG is the third or even 4th game in the series (depending on how you count OG gaiden). This was addressed in interviews before the game came out. Fine then. Whatever game they include the W folks in then (god only knows how they're gonna change the numbering scheme to by then anyways). As for the Bellzelute/Coustwell thing, I have no idea how they really stack up to each other due to not having played J (and not having immediate access to this game). I just heard about the Coustwell lacking its powerpuff specific finishers for this game. That said, at least I got a kick out of this: http://i.imgur.com/wuAhBFA.jpg (leaving it in a link in case of spoilers). For you intrepid importers of giant robot animes out there, have a trailer. that crossbone animation. also the originals are from 4 F and F final. OMG, I missed a trailer. I need to send this to my fellow SRW friends. I love Amuro and how he says FIN FUNNEL. Why does he say this in English? lol Regardless, I love the Gundam High V.
Oh, and we get to see the original protagonists. Sweet. 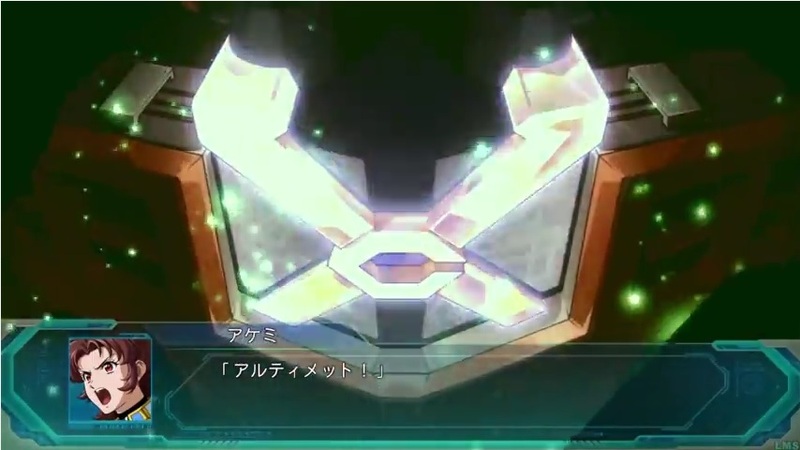 So it seems our original mech for this game is a Gundam-clone. lol Not that I'm complaining. Its like a more heavily armed Gundam Buster, already one of, if not THE most heavily armed Gundams lol. Male protag looks swag. Female protag has some huge.......assets. And Engrishu Releasing the Version Date. Get your imports ready! Einst! Zewi! Dry! Pardon the double post, but amidst the chaos of this week, this almost escaped notice. The only problem is that we still haven't gotten any real footage of the English version, but hey, take what you can get. Everything's better under Okita's watch. Or better yet, between SEED Destiny and the 00 Movie. The good news: You'll get plenty of Gundam action either way you go! The bad news: You'll get plenty of Gundam action either way you go! Frick the Kobayashi Maru, that's a no-win scenario.